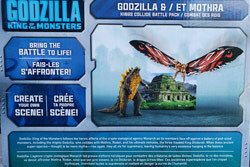 The Godzilla/Mothra set is one of three playsets for the Godzilla King of the Monsters film by Jakks Pacific. While it may seem like a sparse set, creativity wise, there’s more there than it seems. For Mothra’s design, she's in a battle pose which looks pretty nice and there's a nice bit of detail on the back and shoulder area and in the face. The claws have a little bit of detail as well which adds a little ferocity to the figure. 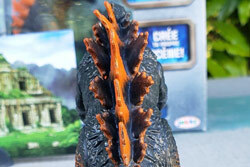 Godzilla's design is similar to the 2014 figure. The tail comes in three sections that you have to put together, and the back plates are more the traditional-style than the 2014 Design. Overall it looks okay. It seems to be more of a generalization of what's going to be in the film as opposed to something fully detailed. 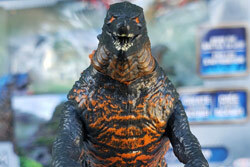 Godzilla has legs can move up and down and so can the arms and the head can move 360 degrees. For the tail, there's no movement at all. Once you attach the tail in the three pieces that comes in, that's it. Be careful not to move the legs up too far, otherwise they'll pop off and it’s the same with the arms. 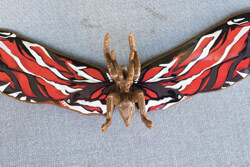 Mothra doesn't have much in articulation outside of the wings. They can move up slightly and a little bit back and forth and that’s about it. For accessories, there's a cardboard background with the stand to encourage photography/more imaginative play which is a great bonus. The problem is that the background isn't as big as it should be because the monsters are bigger than the background. It's printed on a piece of cardboard and the stand does a very good job of holding it in place. For paint it's pretty much just one color. It's applied sparsely on the figure one leg has more paint on it then the other and the center leading from the base of the tail all the way up to the neck is thick in spots, specifically the Torso. The back plates are painted on one side for the outer place. The middle plates are a painted but seems to be a very quick job. They do have a nice orange glow to them and the eyes although uneven look okay. For Mothra, there is not much at all. Outside of just the metallic blue paint for the eyes there's really nothing to speak of. The wings themselves just have stickers on them There's also no paint for the body/wing mold- it's just the brown mold color. 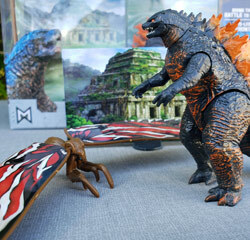 This is a pretty cool set and it doesn't really matter that Mothra is of limited movement. Kids will still make her fly around and bash into Godzilla and most likely have hours of fun doing so. I do like the cardboard background addition and hope that inspires the intended audience to make their own Godzilla films/photography.